The first thing to say about movement building is that it is really hard to do. When you step back and think about the number of recent successful social movements you can probably count them on one hand, maybe two, but there just aren’t that many. One of the reasons it is so hard to build successful movements is because people working for social change often build their efforts around charismatic leaders. Charismatic leaders bring a lot to social change movements, but they can also threaten a movement’s longevity. When your movement is based around charismatic leaders it makes it difficult to develop the leadership from within your support network that will sustain the movement in the long run. When I first heard about the Action Circles model for leadership development it instantly made sense to me. I have personally seen what happens when you don’t have leaders who are ready when it is time to pass the torch. When I was 5 my parents made the decision that they wanted to follow their dream and build a professional summer theatre. Both my parents worked as educators so this meant that instead of summer vacation we had 100-hour work weeks and a whole lot of happiness. This was truly a labor of love, and through their leadership they were able grow the Saxtons River Playhouse from a cast of one on a matchbox stage to a cast of 25 in a barn they renovated into a functioning theatre. From the very beginning the whole effort was centered on a small core of charismatic leaders. My uncle took charge of building sets and managing the house, our long time costumer worked miracles with a sewing machine, and my parents took care of everything else. There were plenty of enthusiastic volunteers. Some volunteers even progressed to the point where they were engaged in high risk actions such as helping with casting and managing the box office. I even progressed from bit parts as a kid in the chorus to directing our children’s theatre program and running professional auditions. Despite the strong support, we never were able to develop leaders who could replace or sustain what my parents and the rest of the leadership team brought to the organization. After 16 years, the wear of time, long hours, and little to no pay finally took their toll on the leadership team and my parents realized that they just couldn’t keep the theatre going any more. I know that they wish it were still running, but there just wasn’t anyone able to replace the leadership team when they had to step down. This was what was going through my head when, as an intern at Rural Vermont in 2010, I first heard Amy talk about the Action Circles model. Running a summer theatre is of course different than building a movement for social change, but there are a lot of similarities. Theatre and social change movements are acts of faith. You have to trust that when you set your intentions others will join with you to create something that wasn’t there when you started. Both require those involved to take a lot of risk to achieve their goals, and there isn’t a whole lot of money in either type of endeavor. In both situations the presence of a charismatic leader can really help get things off the ground, but you need to be developing new leaders if you want to create something that lasts. When I first heard how the Action Circles model can build sustainable movements, I couldn’t help but think that if we had been running the model the theatre might still be up and running. 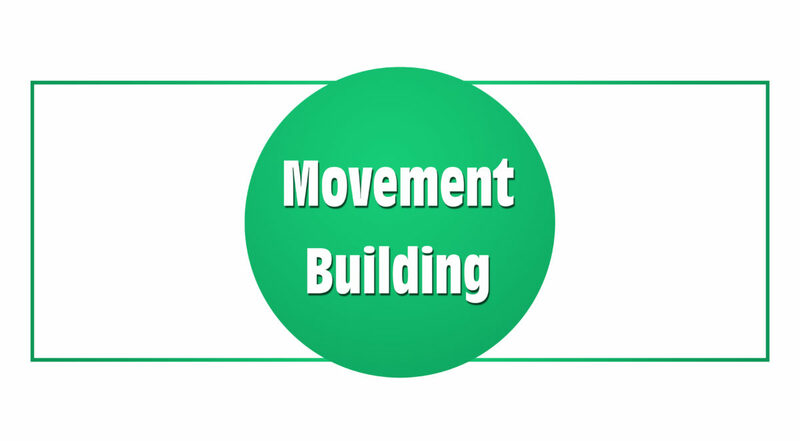 There is more to movement building than leadership development, and this is how the Action Circles principles were developed. When they are combined they allow people and organizations to make amazing things happen that they could never accomplish on their own. Below you can find more information about other factors to think about when trying to build a social movement. Building a movement is about bringing people with common interests and goals together, working through issues with a democratic decision-making process, building solidarity and trust among people, and building skills and leaders in the group. A group like this can tackle many problems successfully. Movement building is not about telling people what to do or how to do it. It’s about supporting people to find their own path and build their own skills. Movement building is about setting a high standard and having high expectations for participation and contribution from everyone in the group. Movement building is about celebrating every victory and learning from every mistake. Movement building is about holding each person accountable to the group and acting in solidarity with each other. Movement building is not about rallying around one charismatic leader. It is about rallying around a cause or an injustice, and working together to fight for what is right.